Dantec Ltd has improved its digitial online service for customers. The configurator for composite hoses has now been launched. Users are able to create and compare millions of possible hose combinations, providing purchasers with a time-saving platform without needing to look through numerous datasheets and brochures. It’s a fast and safe service to visualise a required hose assembly or place an order –and also completely independent of the desk in the office. The composite hose manufacturer, near Liverpool UK, supplies 66 different hose types, available in sizes from 1"to 10", each hose assembly being bespoke to customer requirements. This adds up to 23.5million possible hose assembly combinations (so far). This number will largely increase with added options for plugs, caps and accessories. 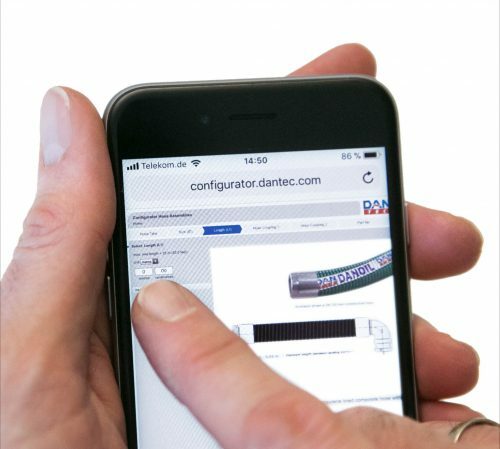 The Dantec Configurator helps the user to easily pick the required hose type by filtering selected specifications. These factors include;application group, material liner, inner helix, outer helix,maximum working pressure,fire-safe technology and the max/min temperatures.